So lately I’ve been getting into some aerial cinematography using quadcopters and I learned a little bit about gimbals in the process (unintentionally). I make some YouTube product reviews in other markets so I figured this would be a good time to invest in a 3 Axis gimbal for my GoPro Hero 3. I wanted to be able to create smooth panning shots and also use it for some of the other things like hiking, snowboarding and eventually mount it to the helmet of my dirt bike. 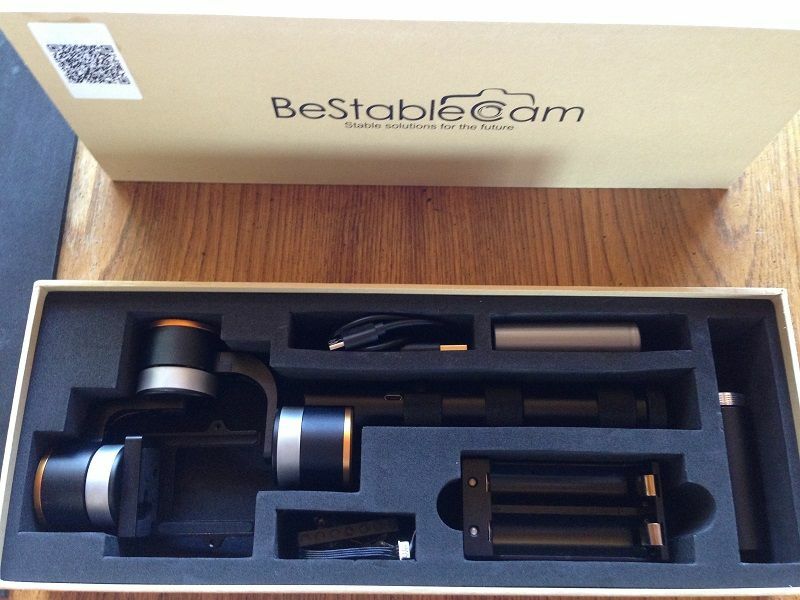 This will be a short review of the BeStableCam SteadyGim3 EVO 3 Axis GoPro Stabilizer but before we get into that I should tell you that I bought the Feiyu G3 Ultra 3-Axis Handheld Gimbal before this one and seemed to be broken out of the box. After some quick google searches, I was able to find quite a few comments about the twitching/shaking motion that my unit was doing. 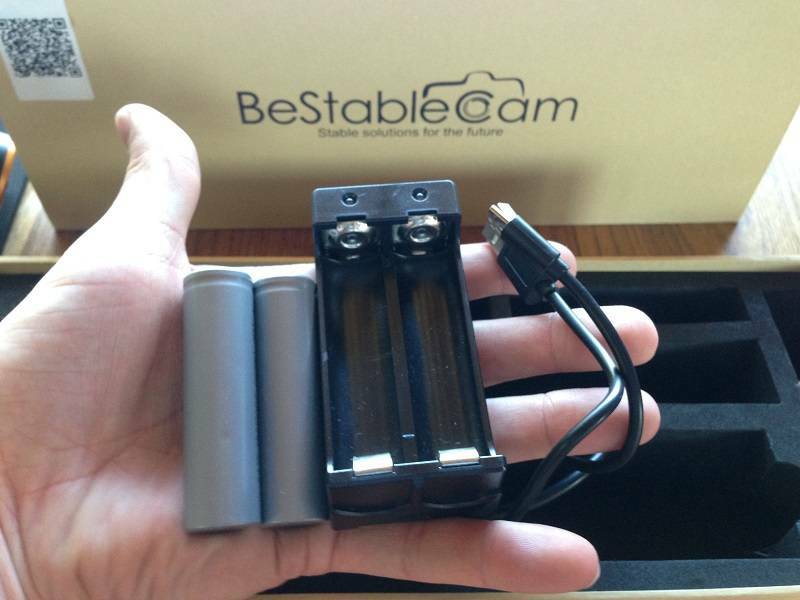 So after returning that unit and talking with the Amazon store owner, he recommended picking up the BeStableCam SteayGim 3 Evo because of the “longer battery life and much stronger motors”. I took him up on the advice and so far so good. Definitely a much stronger unit with much better features. I also had to pay another $80 bringing the total for the SteadyGim 3 Evo to ~$335 so hopefully the upgrades are worth the extra cash. You can pick one up here from the same place I got mine. 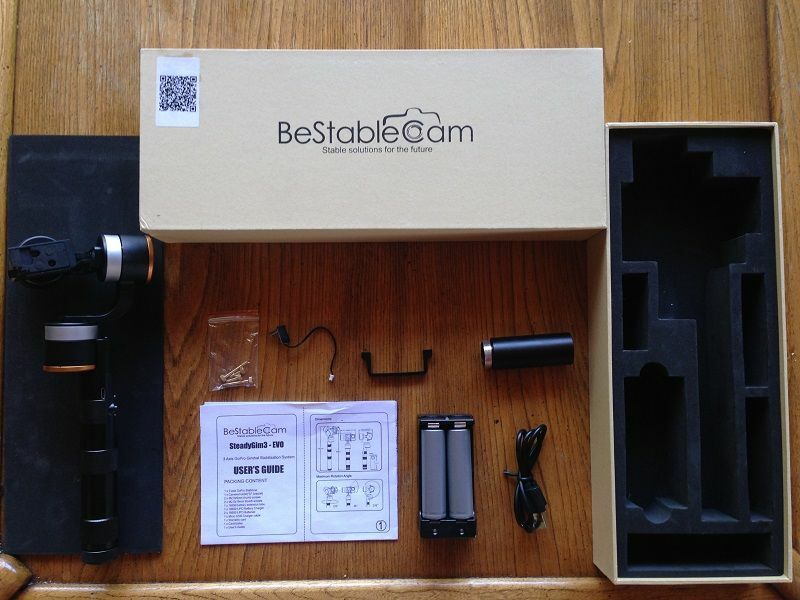 So in the box you get the SteadyGim3 Evo (of course), USB adapter, (1) 18650 battery charger, (2) x 18650 Rechargeable 3.7v @ 2000mAh each, GoPro Holder, (2) x M2.5X9mm thumb screws to use with just a GoPro mounted, (2) x M2.5 19mm thumb screws to use with a GoPro and LCD BacPac (or StreamPac for real time image transmission), GoPro charge cable and the battery extension tube which adds some length to the unit but allows for another 18650 to be added. They pretty much thought of everything that you would need and you are completely ready to start using the unit straight out of the box. Although I do recommend that you fully charge both batteries before use. The features of this unit are pretty good and big improvement over the Feiyu G3. First, off this unit has the ability to manually change pitch angle and roll angel of the gimbal via buttons. The up button will pan up or roll right. The down button will pan down or roll left. The middle button controls the gimbal modes which I talk about a little further down. Next feature that I really like about this unit is that the batteries can be charged via the included USB 18650 charging adapter or they can remain in the device and charge via the Micro USB slot on the device itself. 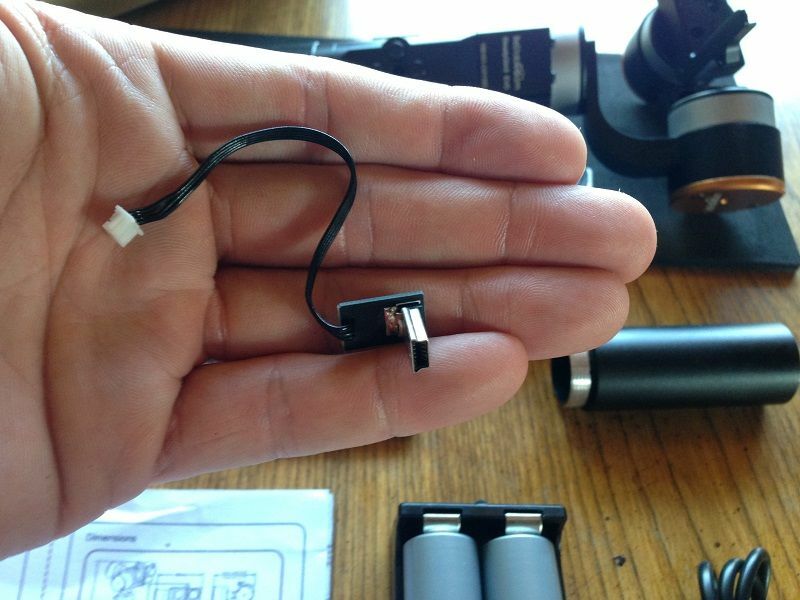 The SteadyGim3 Evo can also charge your GoPro via the included charging cable. I haven’t tested battery life when using this feature nor have I tested how long it would take to charge the GoPro using the device. I will do some testing and report back with the numbers soon. 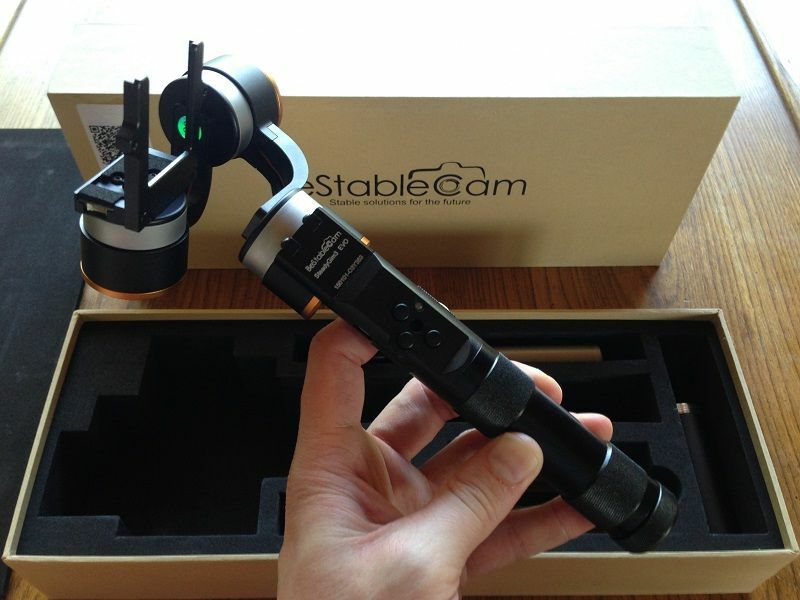 The SteadyGIM 3 comes with 3 different modes. Definition: Roll axis maintains a flat horizon and the camera smoothly moves in the same direction that the gimbal handle is aimed. When the handle is rotated to the left, the camera slowly moves to the left until pointing in the same direction as the front of the gimbal. Use: Used to pan or track a moving subject. Definition: Same as “Heading Follow” but both the Yaw (Heading) axis and Pitch axis follow in the direction the gimbal handle is pointing. Use: For higher or lower than eye height filming. I.E. If you were standing over a cliff and wanted to have it pan down as you went out over it. Definition: Camera locks on to a compass heading regardless of the movement of the gimbal handle. The horizon remains flat and stable. Use: Mounting to a bike or using for selfies. The power button is located at the bottom of the unit. The power button puts the device in standby mode so you can still turn the unit on or off if you have extensions. Hold down the “Mode Button” for 3 seconds to turn on the device. With the Feiyu G3, you have to unscrew the extensions in order to get to the power button to turn off the unit. So it’s really nice to be able to control everything via the mode button on the stick itself. 1) Turn on the gimbal by pressing the on/off button on the bottom of the handle. 2) Quickly place the handle on a stable hard surface and keep still. The battery indication light will start to blink four times repeatedly. 3) Before turning on the stabilization using the mode button hold the up button for 1 second. Watch the amber mode light on the back of the roll motor. The light will now blink three times repeatedly. 4) Press the down button and hold for 1 second. The amber mode light on the back of the roll motor will now turn off. 5) Initialization is now complete. 6) Press and hold the mode button until the gimbal comes to life. Gimbal is now ready to use. 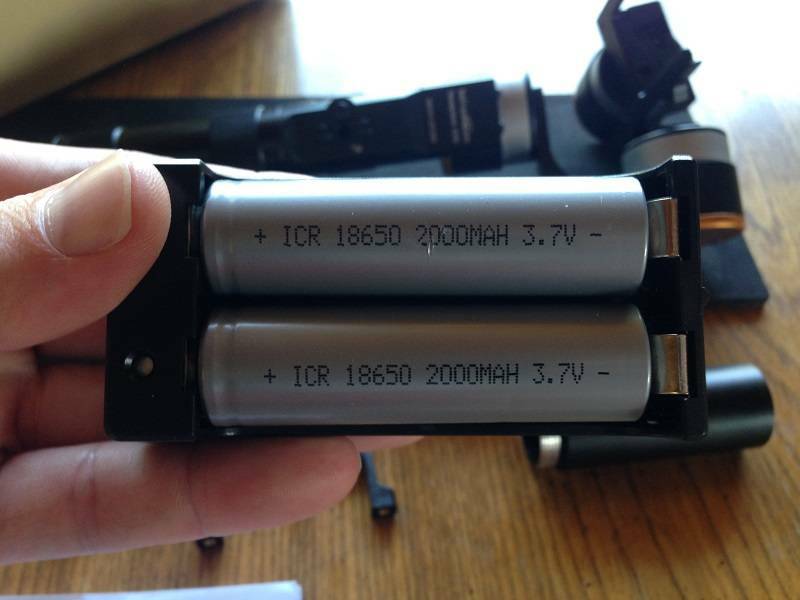 As you can see above the SteadyGIM 3 EVO uses 18650 3.7v 2000mAh batteries. I haven’t actually used them until they die yet and I’ve used it for hours at a time. The website says they will work for 7-12 hours depending on your configuration. The batteries take about three hours to fully charge. Battery levels are indicated by a blue blinking LED just to the right of the mode button. I ended up buying the Feiyutech G3 Ultra Reach Carbon Fiber Extention Pole x 2 when I bought the FY G3. I ended up keeping these and they work with the SteadyGIM 3 EVO. The switch doesn’t quite screw in all the way but it does form a tight lock and functions just fine as a power button. No modifications at all to make these work. You can pick up the extensions for round $30. No problems with the gimbal after the crash. No case and on the GoPro and it was fine as well. There is not so much 3rd party info about the newer EVO model on the internet, so I highly appreciate this informative review. You are very welcome. Let me know if you have any questions about the EVO. Hi! Thanks for the review. How is the gimbal doing since you bought it. Any further information to provide? How is the quality of your shooting and how is the battery life? In the middle of moving so I haven’t been making any more videos recently but I will be doing a lot more once winter comes around. Just moved right next to a ski resort so I’ll be using it a lot for that! Let me know if you have any more questions and thanks for checking out my site. Hey thanks for the comment. I don’t get any humming noises from the motors unless I take it to the extreme fully tilting down. Then it seems like it has some issues but as long as I know the limits it still works perfectly for me. You can also get small little filters to cover the go pro mic I believe and that might help slightly but not for sure on that one. Most of the time that I’m recording with this gimbal, I’m using it for action/sports scenes that will have music or i’m using them for a panning motion for products to which I’ll be doing a voice over anyways. So while it could be an issue for some people trying to film a documentary with a go pro, I don’t really think it’s an issue for me. And like I said, I don’t get the humming noises anyways so I can’t forget to mention something that didn’t happen. Also, you can pick up body mics that will be better for you anyways for less than $25. Thanks for the review! Very helpful! How is the motor noise? I read someone else’s review on Amazon saying it was quite loud. My pleasure, glad I could help out. I’m guessing it was a faulty unit or he needed to correctly calibrate the gimbal before using it. The only time that I get any sort of fuss out of it is when I take to the far point of tilting down and you can tell the motors are working extremely hard but other then that I don’t hear them at all and I don’t ever take it to the extreme angles because I know the limits of the device. It’s worth every penny so far. I just finished up another video hiking in glacier national park and I’ll be uploading it soon. Hey, can you tell how is battery life ? how long does it work using constantly ? A very long time. Probably 3+ hours at least. 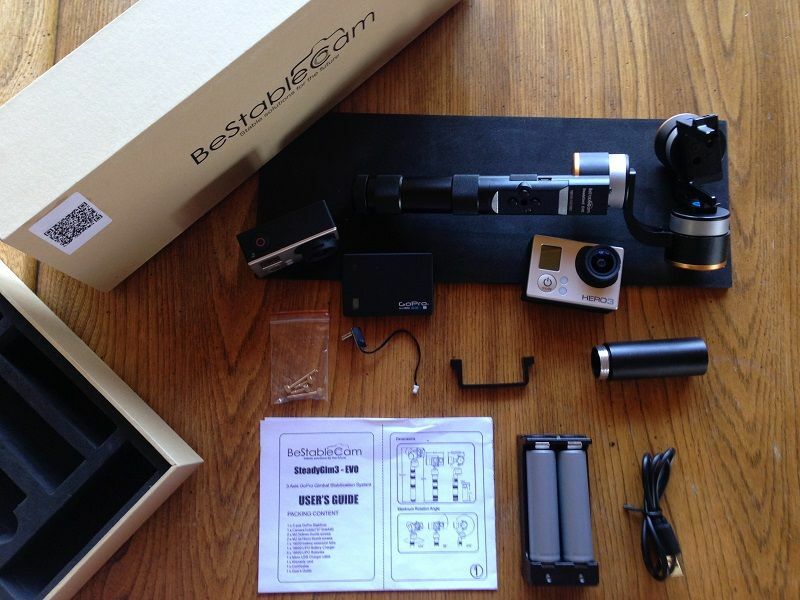 I am interested in purchasing this gimbal. Can anyone confirm if this is the same one I found on Amazon. I want it to be shipped to Australia. Would anyone let me know if there is any other place with a better price. Yes that is a good one to use. Not quite the same one I have but they are both pretty much the same. I’m not for sure about the shipping to Australia. That I do not know but I’ve had zero issues with battery life. They tend to last a very long time. The only thing that I’m not fond of is the external charging dock. Seems fairly cheap and gets pretty hot so be careful with that thing. I think any 18650 will work with the gimbal though. I purchased this gimbal on Amazon and it’s due to arrive tomorrow. Might you recommend a gimbal carrying case that would be appropriate for this EVO 3? I have searched high and low on Amazon, but can’t seem to find something that would hold both my Evo 3 and GoPro 4. Less bulk, the better for me. Maybe something like this if it’s big enough. 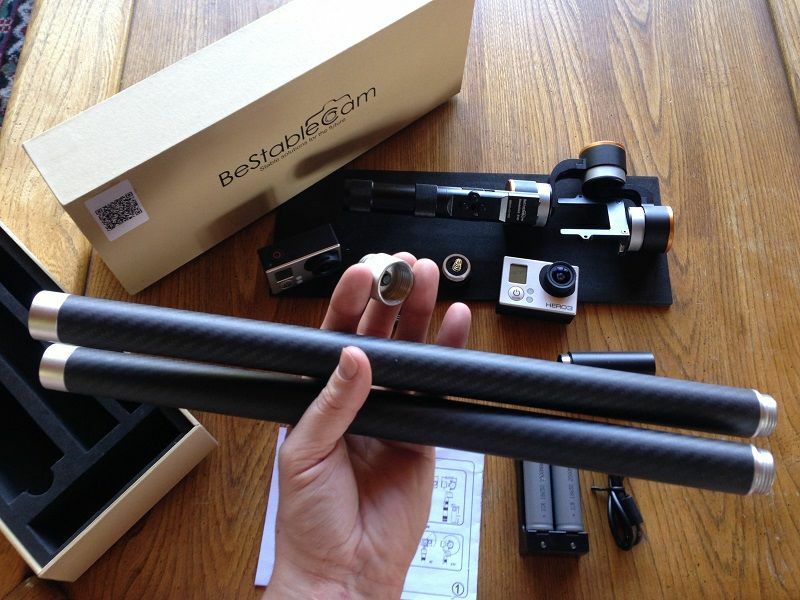 I just got this gimbal. For the calibration, when you say after pressing the power button, quickly put the handle down on a hard surface, exactly how? is it on the table with the cage and GoPro dangling over the edge of the table? Otherwise, the handle won’t be flat? 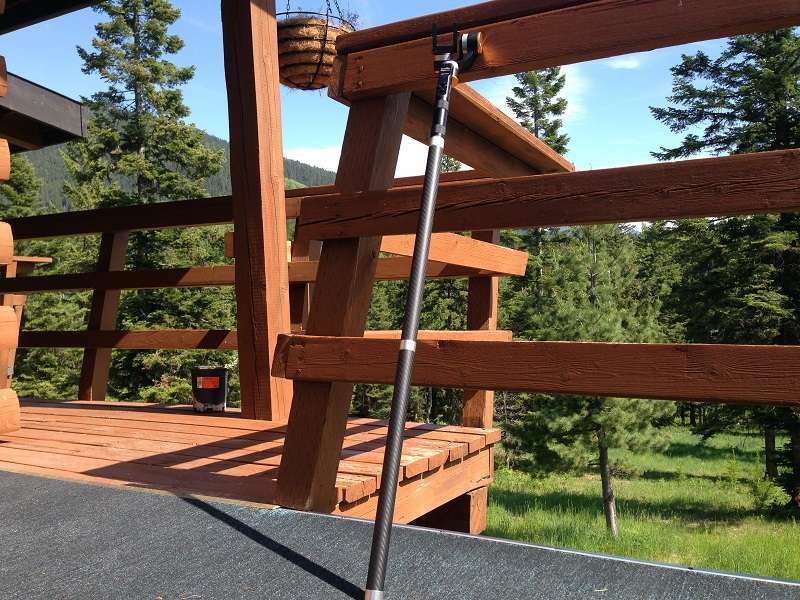 Set the bottom of the gimbal on the table with the gopro parallel to the table. You will need to hold it up.